The day had finally come, after a cold and wet Perth winter, I could only dream of what lay in wait for me over the next week as I checked my mountain of baggage in for the midnight red-eye to Cairns. I had been told to expect endless days of sunshine, warm water, waves and wind, but not even this could have prepared me for what I was about to experience. As the plane touched down in Cairns, the 100% humidity certainly took its’ toll carting 30+ kgs of baggage to the Air Niugini check-in where fellow rider Matt Wessum and I were greeted with a VERY generous baggage allowance of 50kg for kiteboarders and surfers! Qantas, Virgin Blue, Jetstar and Tiger please take note! As our plane touched down in Port Moresby we were greeted by locals dressed in traditional outfits, serenading us with guitars. It was like something straight out of a Hollywood movie! 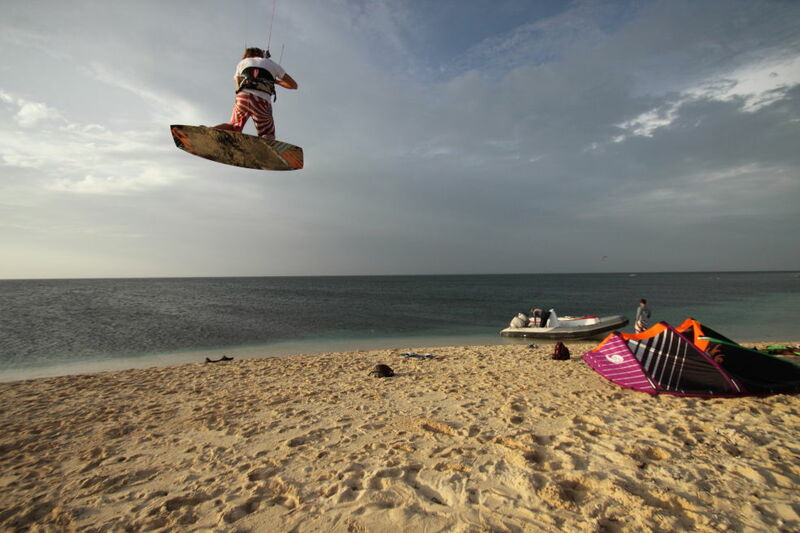 Once we cleared immigration and customs, we met up with Marvin Baumeister from In the Loop Kiteboarding, the mad German who had organized the trip. You could tell from the smile on his face that Marv was amped and we would soon realize why! Leaving the airport we made our way to the boat that would be our home for the next week, the MV Rising Dawn. After loading all of our gear onboard, Marv introduced us to the rest of the crew, the riders: Keahi, Ewan, Luke, Sam, Graham, Joe, Steve and a 17 year old Hula local named Nigel. Marvin had taught Nigel how to ride last time he visited PNG and he had invited him to join the trip as his invaluable local knowledge would only enhance our PNG experience. Complementing the riders were our videographer, Chase Burns from Philip Island and photographer, Joe Millen, both of whom you could tell were eager to get underway and start capturing images for the film that will surely entice others to this beautiful country, the Land of Lahara. After, a quick trip to the local bottle shop to pick up some essential supplies, and a warm welcome speech from Andy Abel and Jason Pini the PNG Surfing Association Officials, we were on our way, destined for our first anchorage, somewhere amongst the myriad of tiny islands that make up PNG. Once setting anchor for the night and gorging ourselves on fresh fish and fruit, everyone made their way into the secluded sandy beach of Local Island behind us for some quiet beers around the bonfire that would burn all night in anticipation of what was in store for us the next day. 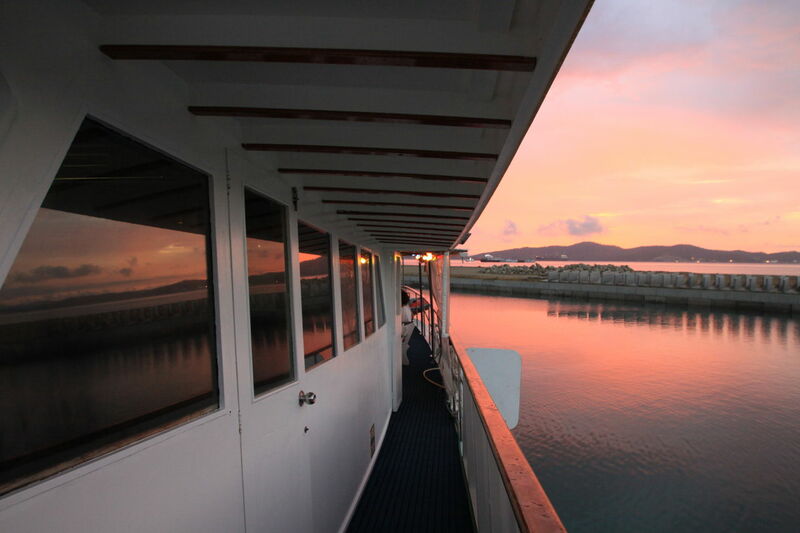 As dawn broke, the captain already had us underway to our first destination, Black Rocks. As I climbed up the ladder to the dining area, a huge buffet breakfast was already served I would come home to WA about 5kgs heavier! Thanx to our amazing Cook!! After a quick swim and snorkel and Stand Up Paddle we decided to move further up the coast to a village called Hula, Nigel’s home town. Motoring in slowly towards the village, our boat was surrounded by villagers in their dugout canoes offering us fish that they had caught only hours ago. I had never experienced hospitality like this, it certainly wasn’t something you would ever see in Perth! As there was no wind in sight, we decided we would all head ashore to experience the culture and atmosphere of a true remote village on the East Coast of PNG. As soon as we stepped onto the pristine beach we were instantly surrounded by hundreds of kids eager to learn a little bit about us. Once Chase produced his video camera and began filming the kids were eager to get in every picture that was taken. They certainly weren’t camera shy! After a quick tour of the village our curiosity got the better of us and we started asking questions about something called ‘Beetle Nut.’ We had seen a sign at Port Moresby harbor which banned it from being eaten there so we figured whatever it was it must be good sh*t! The locals were more than happy (I think they were smiling red a little too much actually) to help us out and soon we were all chewing away, getting red stained mouths and dizzy heads. Beetle Nut and I didn’t seem to get along too well because I swallowed most of what I had in mouth, which you don’t do and as I was soon the certain of attention for the local kids as I power-spewed everywhere. Clearly an amateur! After a quick recovery though, everyone waved goodbye to the locals and we headed back to the boat to enjoy a spectacular PNG sunset. As the sun rose on another glorious PNG day, we could all feel a slight breeze blowing over the water as we devoured yet another gourmet breakfast. Following a very competitive game of football against the local kids on the beach where we were chased by about 100 kids. By the afternoon the wind was in and everyone was soon up and riding on 12m’s. 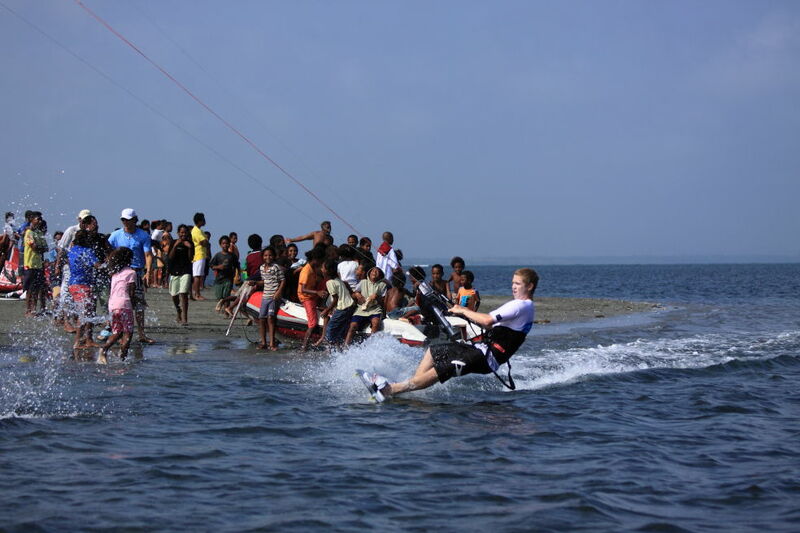 I headed out and got riding up and down with hundreds of kids lining the shore line. EWWS and ARRS could be heard from every point on the beach. Keahi and Luke joined me and we kited for the rest of the afternoon spraying and riding past the kids. They were cheering, throwing balls we had to catch mid air and everybody was celebrating with looks of awe and excitement on their faces. We had an “All Time”. After a solid afternoon session we decided to call it a day and get back to the boat which anchored 500m of the beach on the edge of one of the many reefs that surrounded “Hula” village. Most of us packed up and jumped in one of our two dinghies to head back to the boat, Keahi and Sam kited on surfboards into the sunset back to the boat. Awaking to another sun-filled day, Marvin delivered a wind forecast that had us all drooling in anticipation. After a quick breakfast, wind was already starting to fill in and soon kites were inflated and we were up and riding on the inside of a reef in millpond flat water ride out to the reef where we were going to begin with a photo and video session riding some waves. We were joined by a couple of the local villagers in their dugout canoe which we continually buzzed for a couple of hours. They loved it and handed us 2 Spanish Mackerels as a present. After a big feed of fresh fish we were soon off to our next destination for the day, Shipwrecks. 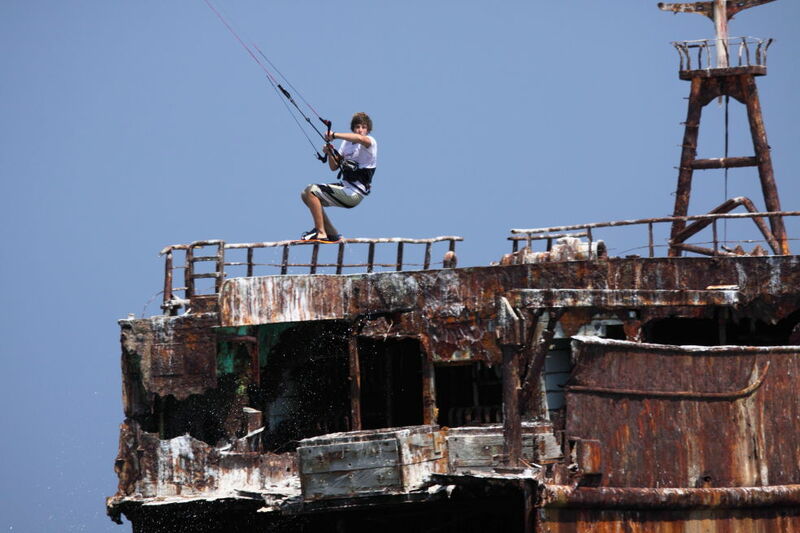 This was an eerie location consisting of an old ship that had run aground on the reef years ago. The massive rusted vessels loomed high above the turquoise reef waters and made for an incredible backdrop to kite against. Matt and Keahi kited a few miles through the reef to get to the wreck allowing Chase and Joe the opportunity to capture some incredible images! Not wanting to waste any of the wind that was now blowing strong over the massive reef, we quickly packed up and motored to a new location, Black Rocks. Captain Graig had been raving about this spot, so we had very high expectations, all of which were soon well and truly met! 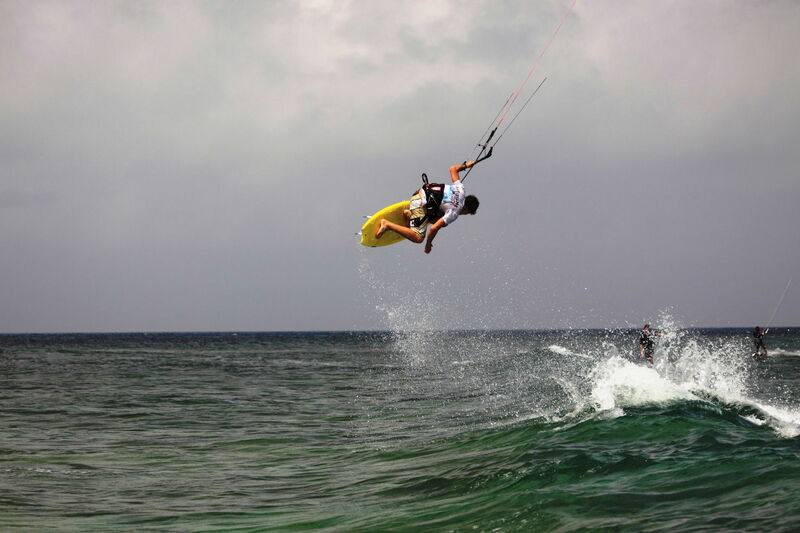 We were the first kiters to ride there, like in many other locations we would kite in the next days. Upon arrival at low tide, we were greeted with a long, exposed sand bar with a set of Black Rocks extending into the sea and wind blowing directly over it. This created some butter smooth, flat water which made for one very intense, four hour down wind session involving some big boosting and kite looping in up to 30knots. We stayed there to sunset and kited for about 5km downwind back to the boat. Some of us have seen some strange things in the mystic crowded palm tree forests behind the beach. Nigel told us some stories about Black Magic that this place was known for. We were feeling the Voodoo by now. That night we relaxed around the TV by introducing Nigel to Team America. It was our last full day on the MV Rising Sun and after experiencing what we had over the past 5 days, it was going to be very hard to top the locations we had visited. We visited a village on the coast that was built on the water but unfortunately the wind wasn’t up that morning. Once back on the boat I had a nap since I was still feeling a bit sick and as I awoke to an island landscape of perfect white sands, palm trees, turquoise reef water and a gentle breeze already starting to fill in. We landed on “Idia Island”. It seems Marv and the Golden Dawn crew had saved the best to last however. We walked over the island and explored this beautiful sandy island surrounded by massive lagoons, rocks and reef. 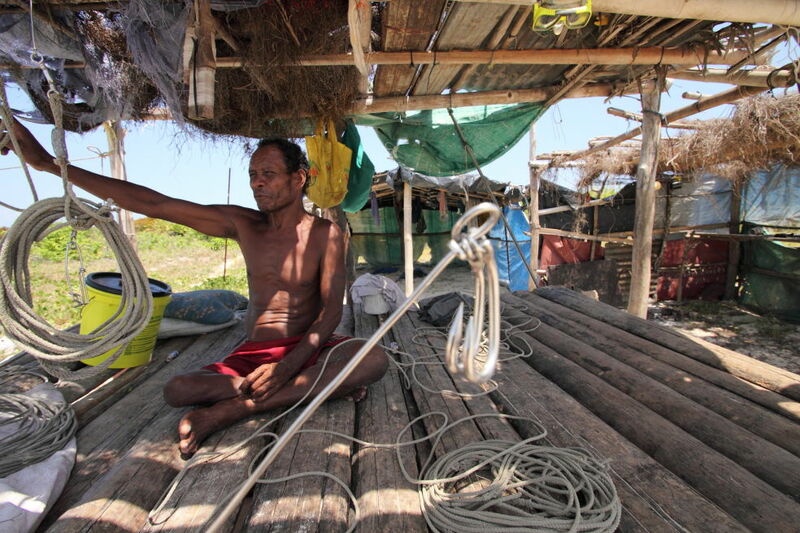 We touched base with the few people living on the beach of the island and we welcomed warmly. Most of them have never seen a white person and some of the kids started crying because they were scared of us “Dim Dims”. After lunch we had 25-30 knots of Lahara winds ripping in and soon the sound of kites being inflated could be heard everywhere. After yet another massive flatwater session, with some mega loops we took the local kids for rides on our backs and boards. They were stoked. 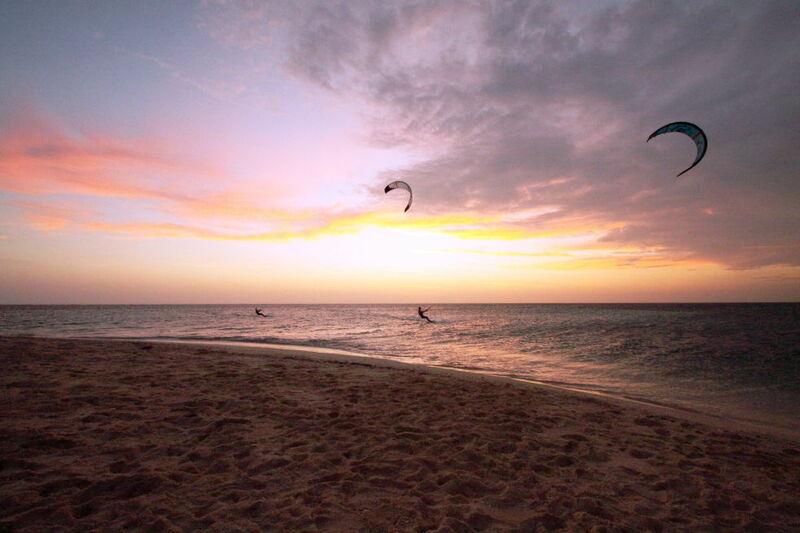 We rounded the day off with a mad sunset session which was the perfect end for another amazing day. Once dark we called it, retreating to the boat for a few beers and reminiscing about what had been a surreal kiting experience for the past 6 days. As dawn broke on our last day in PNG I stumbled out of bed to a scene that I was becoming more and more used to, a lush island landscape resembling something out of Pirates of the Caribbean: white sands, tall palm trees, deep blue water and small islander huts. We had to squeeze one last session in here on “Fisherman’s Island”, especially considering the 20 knots that was on offer, however this was cut short by the sounds of the deck hands screaming at us to get back on board as apparently a tsunami warning had just been issued for the area! Thinking, this was simply a final parting joke that the crew was playing on us to hurry us back we didn’t exactly rush and we soon saw from the look on the Captain’s face that this was indeed no joke! We began motoring out into deep water as quickly as possible, but much to everyone’s relief (well maybe not Chase, he was hoping to catch the wave on film and sell the footage to Channel 7 for thousands of $), the warning was soon cancelled and we motored back into Port Moresby as planned to go to the Art shop to get some souvenirs and later that afternoon make our connecting flights back to Oz. Papua New Guinea is truly the most amazing place I have been to. 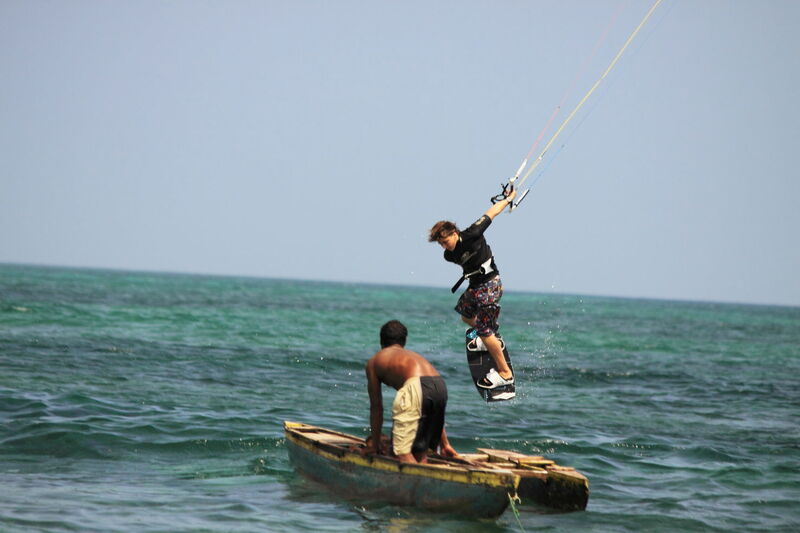 The scenery is absolutely breath taking, the kiting conditions world-class, the culture, experiencing the unexpected and the local people are amongst the friendliest I have ever met. I could talk for hours about why you should visit this country but I’m sure the experience that I have just shared with you is more than reason enough. Get in touch with Marvin from In the Loop and experience it yourself! You won’t be disappointed! Thanx to all of our sponsors and everybody involved that made this trip the start of a beautiful future for kiting tourism in PNG. All photos by Joe Millen from Adrenalin Rush Australia. Make sure you check out our DVD, “Land of Lahara” by Chase Burns.